Good morning, and happy Friday!!! By now, many of you should be back at school or college/university. Having spent the first week going through course syllabi and getting started, professors launch into lectures and teaching course material. This means that everything discussed in class may be important for future studying and getting a good grade. All professors have different teaching styles: some hand out worksheets, some stand at the front of the lecture hall and just talk, and some display slideshow presentations with notes (and even post them online if you’re lucky). Information presented in lecture is typically the central concepts of the course most likely to be included on exams. The key is to develop a note-taking system that enables you to perform the three R’s: review, remember, and reflect. By review, I mean that you can flip through notes after class and make sure you understood all the concepts covered and mark those you need to seek clarification on from a professor during office hours. Notes also have to be conducive to remembering, so having short, to-the-point notes in bullet-form or numbered off are a real asset. I remember in my first year, all of my notes were in full sentences. Looking back, I was just wasting time in lectures and cramping my hand for no real reason because no one but me was going to see them, and thus I didn’t need perfect grammar and punctuation. Finally, reflecting on notes is a step that I know a lot of people either skip over or don’t know about. Finding ways to connect lecture concepts to notes and readings from earlier in the year or even from different classes is an excellent way to test subject matter knowledge and to better understand how the concepts learned fit into the larger picture. Look over your notes from the previous class and prepare for the day’s lecture, anticipating themes, concepts, and ideas that the lecturer will likely present. I know no one likes the idea of sitting up at the front of the classroom but it is a great way to guarantee you will see all of the professor’s notes, be able to hear them clearly, and not be distracted by people on their laptops. 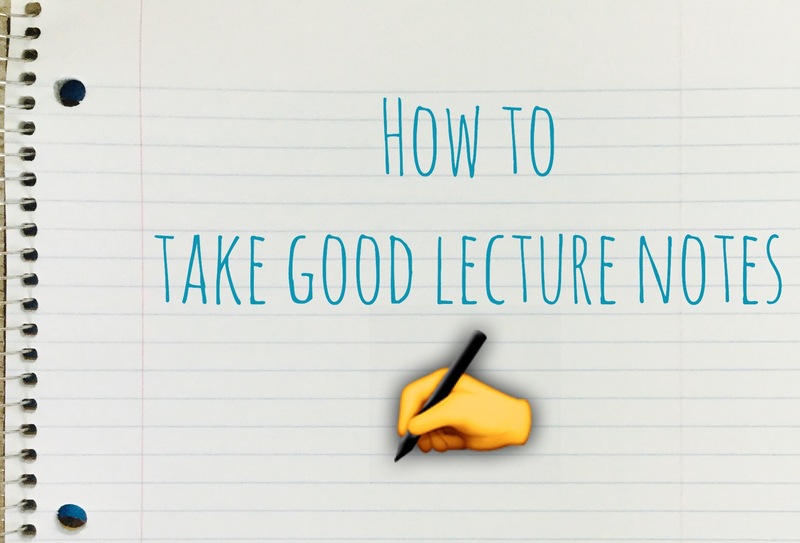 Lecture notes should be the bare-bones outline of the professor’s key ideas along with any examples discussed that make them easier to understand and apply. Jotting down particular terms used and their definitions, and class contributions are both helpful ways to expand upon what is covered in lecture and better prepare for exams. Writing out index cards for a course is another good way to specify the important concepts of a class and test your knowledge of them throughout the term. Trust me, I understand the temptation to scribble down every word of a professor’s slideshow notes, but this isn’t an effective use of time. Sure, you have all the notes, but odds are you didn’t really think about what you were writing down, or how it fits in with the rest of the course. A much better idea is to write down the main concepts first and then add in filler words if you have time later on. Also, leaving blanks in your notes is a good way to indicate that things are missing and can be filled in after class using the textbook or other learning resources. By this, I mean take notes using the tried-and-true pen and paper method. Typing out notes is an awesome way to make sure you get everything down from lectures, especially if you are a slow writer, but studies have shown that people learn much better from physically writing out the words than they do hitting lettered keys to form them. Actively listening to a professor is a good way to study during the lecture itself. By learning the material as it is taught, less memorization will be needed when it comes time to study for an exam.Plus, professors often have little “tells” that indicate when they are about to cover an important topic, such as long exhalations, change in intonation, sits down, and so on, so those portions of lecture notes can be marked as essential to review. I for one detest raising my hand in class to ask questions but it is the best way to seek on-the-spot clarification of a topic not fully understood. This will also help with making more specific and useful notes that highlight difficult concepts. And those are my 7 tips on taking good lecture notes that will help with effective studying for tests and review for exams. How do you take notes during classes or lectures?? ?